The Raritan MasterConsole CAT MCCAT116 is a 16 port Cat5 KVM switch which can control up to 16 servers, and switches can be cascaded to control up to 256 servers at distances of up to 150 feet. 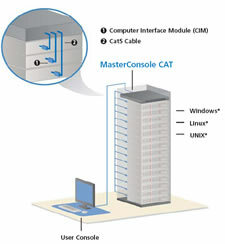 The MasterConsole CAT5 Switch works with every leading server (Microsoft Windows NT, Windows Me, Windows 2000, Windows XP, Windows 2003, Windows Vista, Novell NetWare, UNIX and Linux) and uses Cat5/6 cables. MasterConsole CAT provides a dedicated, intelligent processor at each port so each connected server "sees" its own keyboard and mouse, a unique "keep-alive" design which ensures nonstop server operation in case of power loss to the switch and the support of high-resolution video - up to 1600 x 1200. 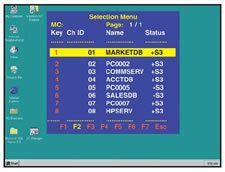 In combination with leading-edge technology and scalability such as server selection from the front panel channel buttons and by name from pop-up, on-screen menus. Supports the highest video resolution of up to 1600 x 1200 @ 60Hz in 100 feet and 1280 x 1024 in 150 feet. MCIMs with "keep-alive" technology allow users to add, remove and hot-swap components without interruption to the live servers. MCIMs are available in USB and PS/2 for support of various servers and devices in your data center. Auto-Switching Integrated power supply ensures proper power provision and system reliability. Plug-and-play installation, auto-configuration along with easy-to-use, on-screen displays. Works with a mixture of servers having PS/2 and USB interfaces. Utilizes Cat5e cabling to carry the KVM signaling from the modules (MCIMs) to a single user console. 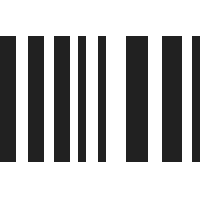 Targets can be labeled with devices' names which allows easier server selection from the on-screen menu. Password authentication Support of one administrator and five user profiles for basic management. Question: how many dongles does this switch come with? Answer: Thank you for your inquiry. To allow for the greatest flexibility in configuration, this switch does not come with any dongles. There is a bundled unit, the MCCAT116-PAC https://www.kvm-switches-online.com/mccat116-pac.html, which comes with 16 MCIM-USB dongles.